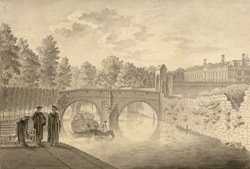 View of a small two arched bridge leading to a range of Clare College. However this is not Clare College's Bridge. The bridge actually belongs to King's College and connects King's College Meadows with the college buildings, although this angled view does not actually shows any of King's College. There was a bridge here by 1472-3 which was frequently rebuilt in the same place. This stone bridge was built by George Thompson in 1627 which replaced an earlier wooden bridge.